I was one lucky girl being able to visit Melbourne’s Craziest Mega Milkshake Café ‘Sugar Buns’’. I lined up for up to 30 minutes to try my amazing “Candy Land” Milk Shake when they first opened. There were so many people there wanting to get in and try it, they even gave you menus while you lined up which help me make up my mind on which one to get! ‘Sugar Buns’ is located at Hampton Park Shopping Center, they are a café/Restaurant and I have now heard they take bookings for Birthday parties! – Can you imagine? A Mega Crazy Milkshake Birthday Party? That’s Crazy and I like the sound of it, haha. Candy land mega Shake is the one I ordered and it was full of lots of lollies, sour lollies, candy, fairy floss, ice cream, marshmallows, liquorice all sorts, candy cane, popcorn all in a bubble-gum flavored milkshake, It was CRAZY!!! Craziest Mega Milkshake At Sugar Buns !! I started Katie’s Playtime YouTube channel over 4 years ago. I have always loved doing home DIY craft and activities so I decided to share my ideas. My first video on Katie’s Playtime was How To Make Play Dough – Non Toxic, No Cooking and over the last 4 years I have made over 100 videos! 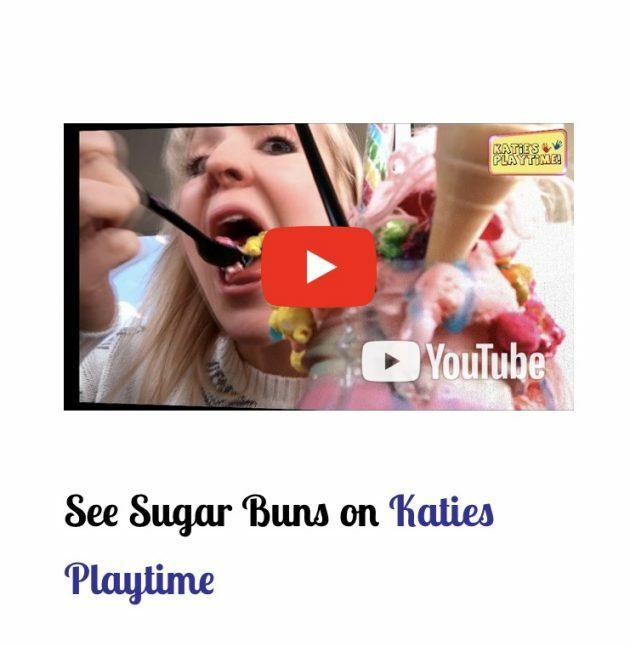 If you love seeing my Katie’s Playtime videos don’t forget to Like, Comment & Subscribe to my YouTube channel and I’ll see you in my next video, Bye for now ! I’m On The Daily Mail !! Beat The Mitey Drum Challenge!